One of the most important rooms in a house is the bathroom. We spend a lot of time in a bathroom getting ready to face the day ahead. A nice warm shower or luxurious bath can truly make an impact on direction of the day. But, did you know that the right paint color can also create the right mood for a bathroom. When painting a bathroom, there are a lot of options to consider, especially in humid cities like New Orleans. At Helm Paint & Decorating, we have a great selection of paint that is designed for damp bathrooms. 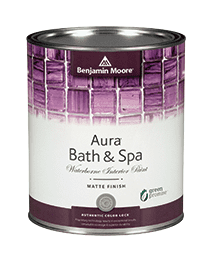 Benjamin Moore Aura® Bath & Spa Paint is the only paint with both mildew resistance and a luxurious matte finish that stands up to humidity, so you have a stylish spectrum of worry-free color options. Why Aura® Bath & Spa Paint? Bathrooms are wet and humidity is very high lingering in the small room. It is important to choose a paint that specializes in wet and dampness. The Benjamin Moore Aura® Bath & Spa Paint is the only paint that helps resist mildew and humidity. This paint has a lot of great attributes that make it perfect for a bathroom such as: Zero VOCs, stains wash off easily, Color Lock technology, paint and primer together, and are great for high-traffic areas. So, if you are trying to fight off little dirty hands and toothpaste splatter in a wet bathroom, the Aura paint is the best and only choice. Paint colors can impact your daily grooming or make application process. Some colors can recast the light in an artificial or unflattering way. Strong Blues, Greens and Yellows have a strong impact on light, but creamy whites and soft grays are safe choices. Colors are impacted by lighting, both natural and artificial, so test your colors in your bathroom before committing to them. In the end, the color you choose should be based on what makes you happy with your bathroom.